How do these affordably stylish smartphones compare? 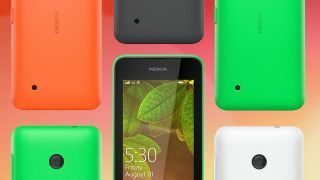 With the recent Nokia Lumia 530 unveiling, Nokia has launched its latest attack in a sustained assault on the entry-level smartphone market. A flurry of stylish Lumia smartphones at low, low price points means that one of Nokia's biggest rivals is itself. The Nokia Lumia 630 launched just a couple of months ago, and impressed with its cost-effective Windows Phone 8.1 allure. Then of course there's the king of the low-priced smartphones, the Motorola Moto G. It offers a near-premium Android experience for not a lot of dosh. So which of these is best for you? Join us as we take a closer look. Price is the key factor with each of these smartphones, so it's only right that we start here. The Nokia Lumia 530 should prove to be the cheapest phone of the three, with an estimated SIM-free price tag of around £70. Both the Nokia Lumia 630 and the Motorola Moto G, meanwhile, have a recommended retail price of £130. That's quite a bit more, but it's worth noting that you can pick both up on PAYG deals closer to the £100 mark if you shop around. Also, both of the more expensive handsets hold technical advantages over the Nokia Lumia 530, as we will now consider. Nokia is the established master of making cheap phones look and feel good. It appears to have continued this trend with the Nokia Lumia 530, despite it being the cheapest phone in the range. Both it and the Lumia 630 are resolutely plastic, with colourful removable rear shells that enwrap the entire rear and all sides of the phone. It's a design approach that the Moto G also takes, with similarly sturdy (if slightly more sober) results. Otherwise, the Nokia Lumia 530 is the thickest of the three at 11.7mm, followed closely by the 11.6mm Moto G. The Lumia 630 is a relatively svelte 9.2mm thin. The larger Lumia is five grams heavier than the 129g Lumia 530, however, while the Motorola Moto G weighs in at a pocket-bothering 143g. There's one clear winner here. The Motorola Moto G might share its 4.5-inch screen size with the Nokia Lumia 630, but it has a much sharper resolution of 1280 x 720. The Lumia 630, for its part, shares the same 854 x 480 resolution as the 4-inch Nokia Lumia 530. That makes the Lumia 630 the least sharp of the trio. The Nokia Lumia 530 lags behind in the power stakes, but it's a fairly close run thing. Like the Nokia Lumia 630 and the Motorola Moto G, it features a 1.2GHz quad-core Snapdragon CPU. The only difference is the chipset, with the Lumia 530 sporting the Snapdragon 200 model while the other two benefit from the extra oomph of the Snapdragon 400. The Motorola Moto G's processor, meanwhile, is backed by 1GB of RAM. That's double the memory found in the two Lumias. This won't be noticeable in general navigation, as the Windows Phone OS is known to be more memory efficient than Android, but it does give the Moto G the edge when it comes to advanced tasks and app performance.